Start with creaming the butter. Make sure the butter is at room temperature, else it wont fluff. With the help of a stand mixer or hand mixer, keep beating the butter until its fluffy and airy. Add the sugar and keep beating until sugar completely gets incorporated with the butter. This may take a couple of minutes. Next add peanut butter and keep beating the ingredients together. Now add the egg and vanilla extract. Beat again. In a separate bowl take the dry ingredients i.e flour, baking soda and salt. Whisk them together and make sure everything is well mixed together. Now add the dry ingredients with butter mixture and carefully fold al the ingredients together. Use the hand mixer or stand mixer to do the final fold in. Keep scraping the side of the bowl to ensure even mixing. You should get a dough like consistency at this point. Cover the bowl with a cling wrap and refrigerate for at least 1 hour. Refrigerating will help the batter in firming up. After the cookie batter is chilled, take it out of the refrigerator and preheat oven at 350 F. Line a cookie sheet with parchment paper so that cookies don’t stick to the sheet. Make 1 inch diameter balls out of the batter by rolling some between the palms of your hands. The batter should not feel sticky. Keep rolling until you get a smooth ball. Place these balls on the cookie sheet about 2 inch apart from each other. This is because when cookies will bake, they will expand and when they expand, you wont want them to stick to each other. Now, with the help of a fork, press each ball lightly. 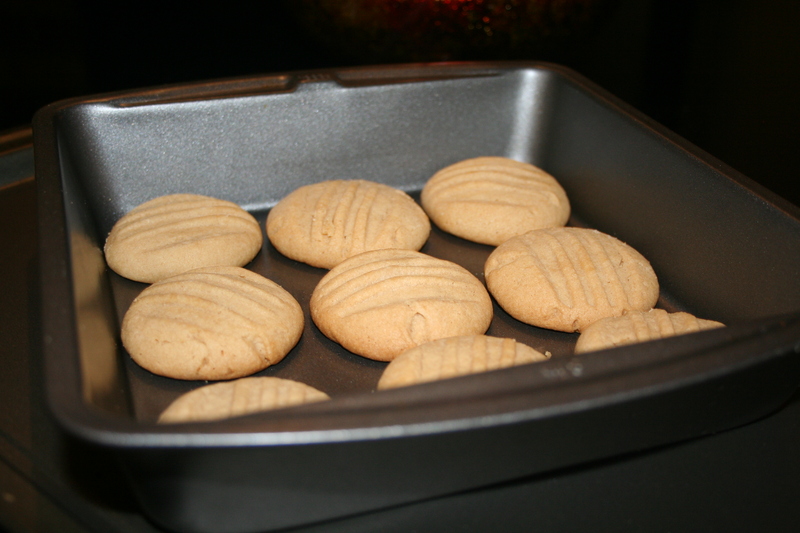 One tip to serve these cookies, warm them up for 15 seconds in a microwave ! !